It’s that time of year, in these parts of the world, at least, that one rises off of one’s bottom and seeks adventure, or a break from the routine, at least. This New York State person is headed out, way out, to the above pictured place. Can you guess where that might be? Gas is relatively cheap now. Put that together with the American love of cars. The result? Pack it to the gills and set off somewhere that you’ve never been before. See, the advantage of a road trip is that you don’t have to juggle weights in suitcases to shove them in a 747’s cargo hold. You have the absolute freedom to take every single pair of pants you own, twenty pairs of shoes, all your T-shirts, most of your sweaters and about eighty percent of your socks and underwear. So what if the trunk won’t close – there’s no weight restriction! Andrew and I decided we’d head off to Atlantic Canada: New Brunswick, Nova Scotia, Prince Edward Island and Newfoundland. I’ve been to Canada a bunch of times, just not there. Andrew’s never set foot in the country. I happen to think it’s a fine place worth visiting over and over again. It is, after all, right next door. As a kid, I dreamed of going to Nova Scotia after seeing such dramatic photos of the Bay of Fundy in a National Geographic magazine. Having grown up on the New Jersey shore, the Atlantic there seemed pretty tame, only eating up a relatively small chunk of the beach at high tide. Here, the beach either vanished entirely or the ocean disappeared. Wow! Years later, after Andrew and I married, he showed me the dramatic tides in Cornwall, England, where he’s from. That was pretty cool, but my curiosity about the Bay of Fundy never abated. I trolled the Internet looking for cool places to visit and pretty soon, the itinerary filled up with New Brunswick – we’re crossing in Maine and I want to see Campobello Island (where President Roosevelt contracted polio and left him crippled). 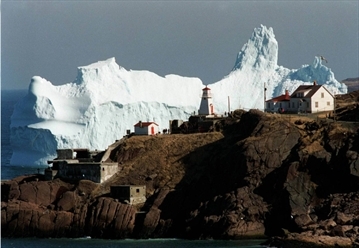 Then up to Nova Scotia, PEI and Newfoundland added spots in our must-see list. Tell you what, though, this website for Newfoundland won me over. It’s not like I didn’t want to see it, this quirky website made it impossible not to. No trip is complete without a reading list. It’s going to be time for me to catch up on my classic sci-fi and I’m bringing along a selection of Asimov, Bradbury and one or two others to read, mostly on that 8-hour ferry ride between New Sydney, NS and Newfoundland. Andrew’s reading “Existence” by David Brin and “The Martian” by Andy Weir. I fully intend to abscond with both at some point. But for now, as we set out on our epic adventure, I might just stare out the window and enjoy the sites on our own fair planet. Or look up and see my favorite constellations in different places. Cross fingers, there could be an aurora – sunspot activity’s been kicking up. I’m hoping to find enough wi-fi sites to do a few postings. And who knows? Maybe I’ll see one of those icebergs drifting by. Have a great time and enjoy the freedom and rest. I look forwrad to seeing the photos and hearing about the trip. The Northern Lights have been making their appearance (briefly) here in the UK, so I would imagine you’ll get a great show when up in the North East tip of Canada.